My chives are in full bloom right now. I think the blossoms are so pretty. This year I’ve decided to actually use the blossoms and I made Chive Vinegar. Chives have a very mild onion flavor. 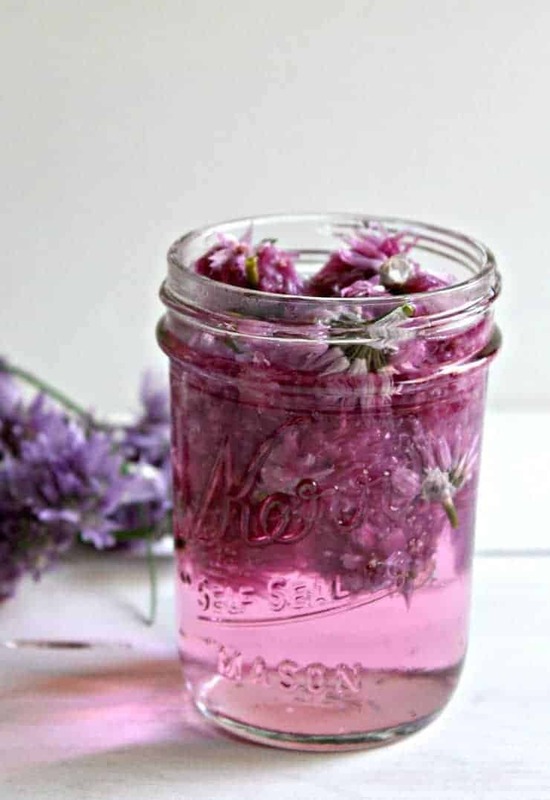 When the blossoms are added to vinegar, the vinegar takes on the flavor and becomes this beautiful lavender color. I went out to check on my garden the other day. My honey bees were busy little bees. They were all over the chive blossoms. My timing must have been just perfect because about an hour later, the bees were all gone. A storm was coming in and before the rain even started, the bees were headed home to safety. Since then, I’ve seen one or two bees back on the chive blossoms, but nothing like the numbers I first saw. I figured the bees were done and it was safe to pick some of the blossoms. 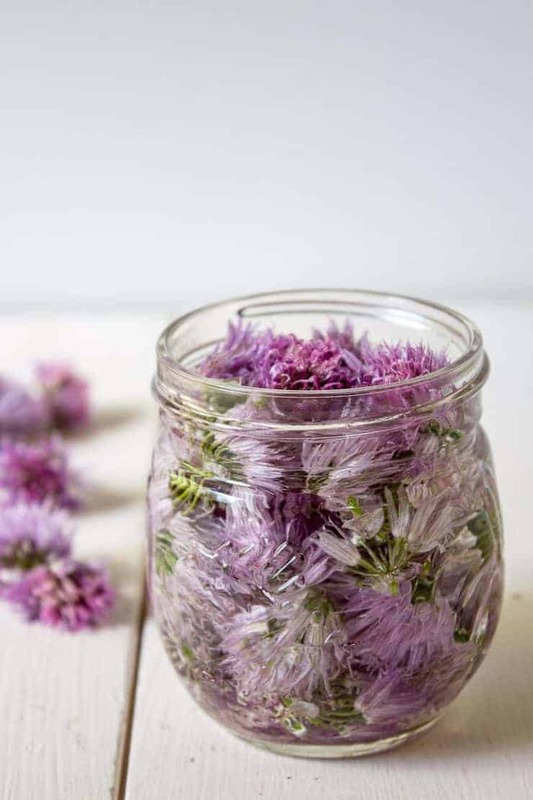 At the beginning the chive blossoms fill the entire jar and the vinegar is clear. In just a couple of days, the chives diminish in size and the color starts to set in. 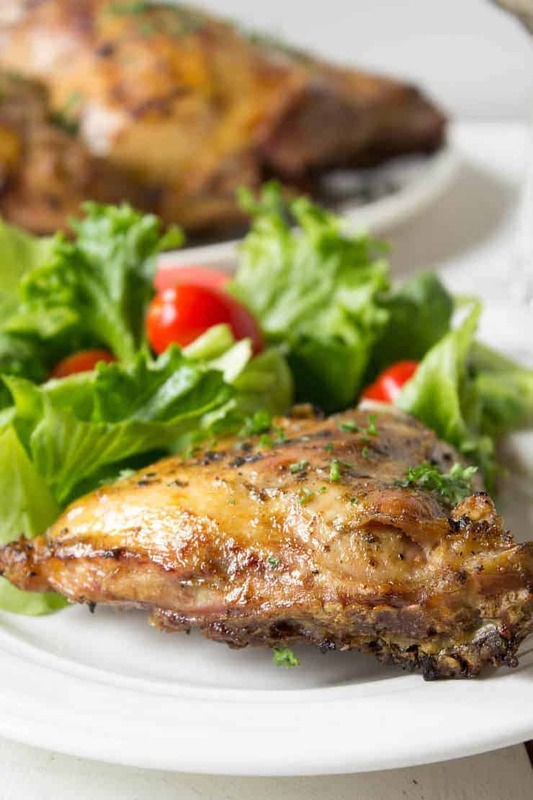 Chive vinegar can be used in place of any regular vinegar in salad dressings or vinaigrette. What to do with Chive Stems? Vinegar infused with chive blossoms. Soak blossoms in water to remove any dirt and small insects. 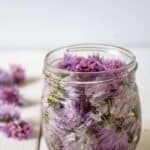 When ready to use, strain off blossoms and use vinegar in any place you would normally use any type of vinegar. I love this idea…definitely need to try it! I am a vinegar addict! 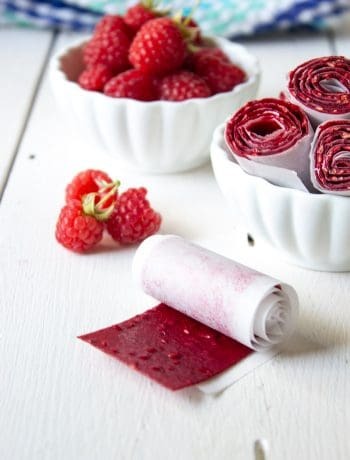 What a great idea, and it is such a wonderful colour! 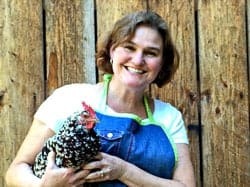 I love these photos, Kathy, and this recipe. I love infused vinegar and this is as beautiful as it sounds delicious. I would love to use it in my salads. You can use it in your favorite salad dressing! I never knew chives had such pretty blossoms! This is such a fun idea. That vinegar would be so good in a potato salad. What a lovely color! My chives are in bloom as well, so I can make this right now. I think I will actually, I love flavored vinegar (my favorite is elderflower vinegar, you should try it). Elderflower! I think it grows around here….I will need to give it a try! There are so many choices with infused vinegars! What a wonderful idea Kathy! 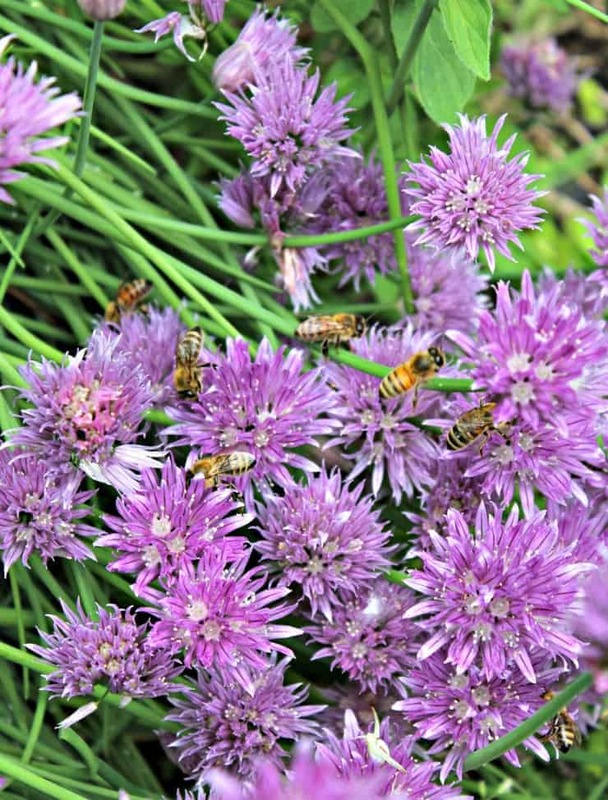 These chive blossoms are so pretty, as is the lavendar color of the vinegar. I love experimenting with different kinds of vinegar, a friend gave me some tarragon vinegar in our Christmas basket last year. I do have chives that have not bloomed yet, you know what I’ll be doing! These would make a perfect gift! I think I need to go plant more chives…like right now. I can’t wait to make this! The best thing about chives is they come back every year and they bloom fairly early! My chives are doing wonderful this year too ~ and I agree so pretty. I’ve been infusing a ton too. Love the pretty purple color they give off. Very nice! The purple color is so pretty! This would make a nice gift too! 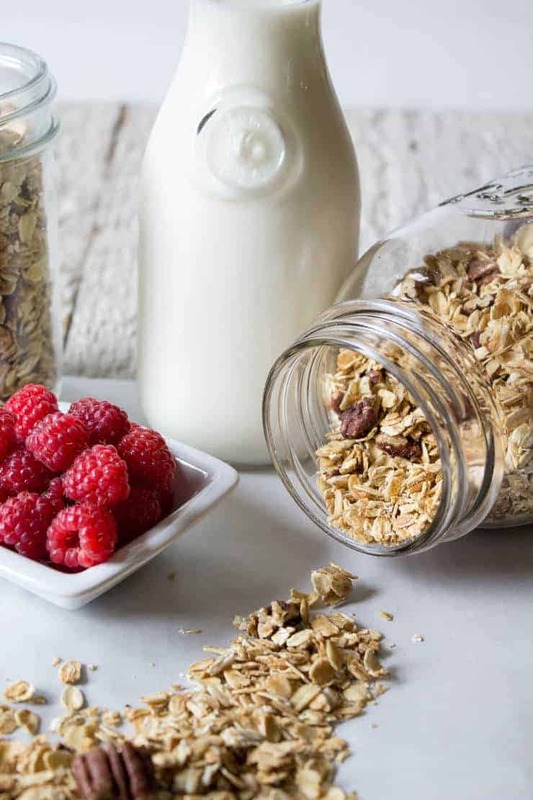 It’s so easy to make and give a burst of flavor! First of all I love all of those pretty pictures of chive flowers. They look to pretty. And making chive vinegar sounds like fun idea, Kathy. I am sure this vinegar would add so much flavor to my favorite salads. It does add a ton of flavor! Oh whoa! I love this creativity! I didn’t think to plant chives in my garden this year, but I wish I had! I love that purple color! I’ll bet this vinegar would be amazing in a salad dressing! I love that close up of all those bees too! The purple color is awesome! I just wish the blossoms stuck around longer. They are showy and then done. I love this! I’m so excited my chives are in bloom now. I have been looking EVERYWHERE for chive blossoms the past few weeks, so you posting this feels like you read my brain! And it feels like a tease since I can’t seem to get my hands on any! lol. Well, if I do I know I will be making some of this fabulous Vinegar with them! So pretty and I bet delicious! Cheers, friend! 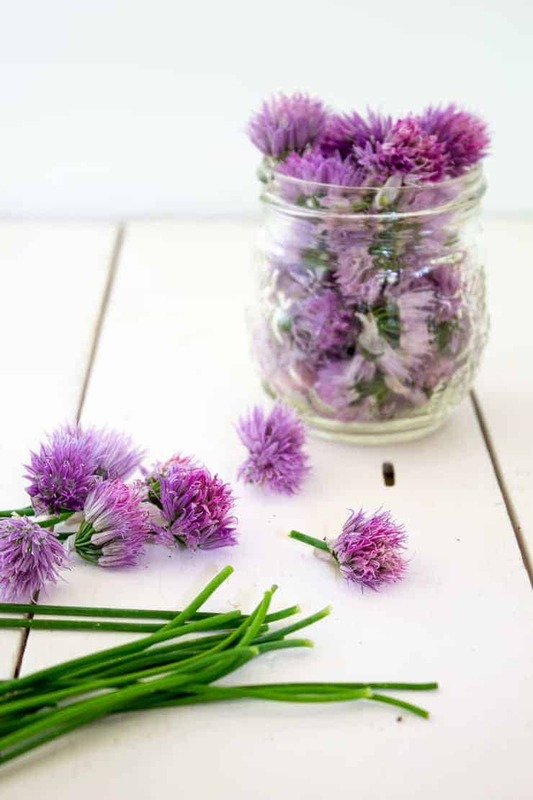 This such a creative and fun use for chive blossoms! 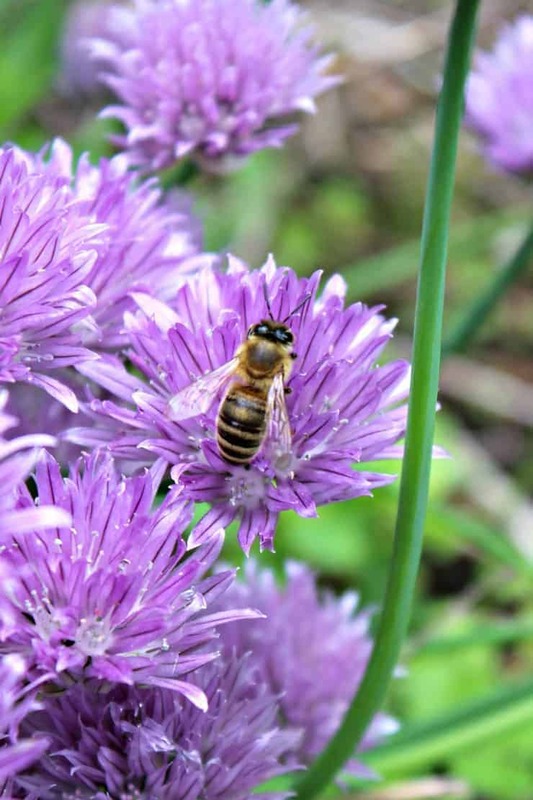 I love the pictures of the bees on the chive blossoms! Our chives haven’t bloomed yet ;-( . Great idea to make a chive vinegar, I had seen it once and I thought it so clever. Great recipe, Kathy! Thanks! I love watching the bees pollinate the flowers. They are fascinating. How pretty is this, Kathy?! Our chives are certainly growing but no blossoms just yet. I love vinegar and put it on almost everything, so this is a wonderful recipe for me to try soon. Just have to wait for those blossoms to come around 😉 Gorgeous pics, by the way! They will be blooming before you know it! Wow…what a fun idea! Our chives are just starting to bloom, but I had no idea you could do anything with the blooms. That photo of the bees is awesome, too! Thanks for the idea, Kathy! I also like to take the blossoms, break them apart and sprinkle the little pieces over a salad!